I really wanted to tell you about the Ubuntu Development Summit in Mountain View, but I didn't know how to begin. In fact, I've been procrastinating for a long while about this, by doing work. Every time I've gone to California, I been caught up by this horrifically fast-paced lifestyle, such that I'm always busy. Which means I barely had enough time to catch my breath, let alone write. Thankfully, Montréal has lulled me with her laid-back charm. So I'm able to sit down and tell you about some of the wonderful things that happened down there. The first morning I woke up to was crisp and clean. I stretched, showered, and walked into the warm Californian winter. The Wild Palms Hotel had an interesting layout as there was no front door. It was almost like a motel, with covered walks and a large courtyard. But no wild palms. I went to the restaurant where I grabbed a few glasses of orange juice, sneered at the fake croissant, and then it was off on the shuttle bus to the Googleplex. We were greeted on the campus by a friendly redhead who apologized for the lack of coffee. Surprisingly friendly, for someone working on a Sunday morning. We went upstairs and were greeted by a room full of people. People from all sorts of open source projects like Beryl, GNOME, KDE, LinuxPrinting, LTSP, and more. People were already starting to mill about, but my first priority was to figure out what was going on. 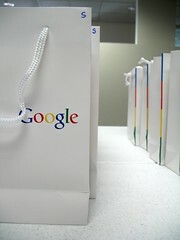 I quickly identified the name badges and then found a table full of Google bags. Inside were a shirt, some blinky LED things, and a pen. Loot bags are always popular amongst geeks and the extra T-shirt seemed to serve some conference-goers well when the clean laundry started running thin. We worked all week on specifications for Feisty. This means going into meeting rooms, sitting down with other people, and trying to figure out what's reasonable to do in five months. Then someone sits down and writes out the specification until it's approved. A lot of people spent a lot of time in meetings, while others hid in corners to get writing done. Those of who didn't hide were often accosted by friendly people who wanted to talk with us. I actually liked these conversations a lot, as you got a broad view of what people were interested in the community. I spoke with a bunch of folks about what they wanted to see in Quality Assurance and promised to send them all e-mails. I really should get on that soon, now that Herd 1 has been released. 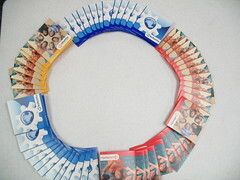 Which reminds me, I certainly have documentation to write up, if I want to get more people on board for that. I was in discussions about automated installation testing, a bug reporting tool that can file bugs right into our bug tracking system, automatic upgrade testing, and improvements on the crash reporter. But not all of my time was spent on Quality, some of the other discussions were based around community involvement and user interface improvements. 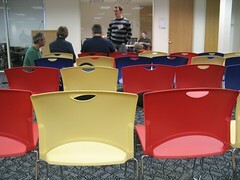 Throughout the week, we also had various presentations every day about Ubuntu-relevant topics. Like demonstrations by the Looking Glass and Beryl projects on nice user-interface tricks. Or reports on the nVidia driver situation and the One Laptop per Child project. By the time Friday rolled around, everyone was awfully tired, and some people could be heard losing their voice. 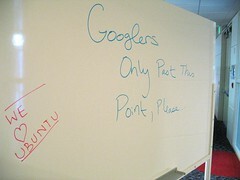 But it was a great experience, especially for people who had never been to an Ubuntu Developer Summit before. I certainly hope to see them again. I do it by hand, based on the output that flickr once gave me, a long time ago.